Congenital heart disease is a major cause of morbidity and mortality. Single ventricle is a rare finding and usually of left ventricular morphology. We present here interesting antenatal and postnatal echocardiographic findings of a baby having a rare single ventricle of right ventricular morphology with double outlet. Antenatally we saw a large ventricular septal defect indistinguishable from a single ventricle with left to right ventricular ratio of 1:1. Postnatally we saw a single ventricle having the outlets for both the main pulmonary artery and aortic root. The left ventricle is collapse with a rudimentary morphology possibly due to changes in hemodynamics after birth and absent of outlet from it. Lynser D, Marbaniang E. Antenatal and postnatal sonographic imaging findings of a single ventricle presenting as double outlet right ventricle with rudimentary left ventricle and single atrium. Russian Open Medical Journal 2015; 4: e0403. Congenital cardiac disease is seen in 2.0–6.5 of 1000 live births and is a major cause of morbidity and mortality. Transabdominal detection of cardiac anomalies is usually done at around 18 to 22 weeks of gestation. Transvaginal scan can detect anomalies even at 12–13 weeks . We present here interesting antenatal echocardiographic imaging findings of a baby at term with subsequent postnatal confirmation. 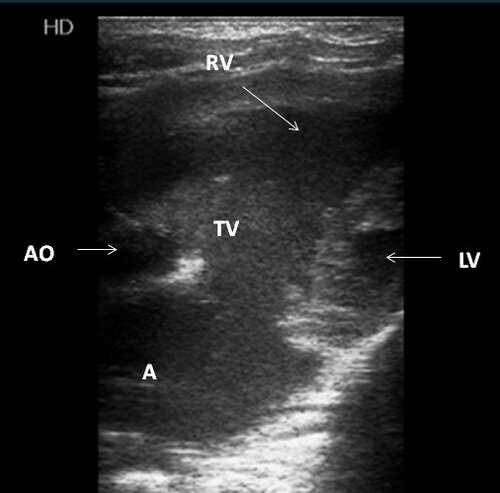 Antenatal echocardiography: Four chamber antenatal echocardiograms show the apex of the heart on the left side, a single atrium with a very large ventricular septal defect (VSD) indistinguishable from a single ventricle. The ratio of the left and right ventricle is approximately 1:1. Both tricuspid and mitral valve appear normal. Three vessel views cannot be carried out due to technical difficulty and foetal position (Figure 1). 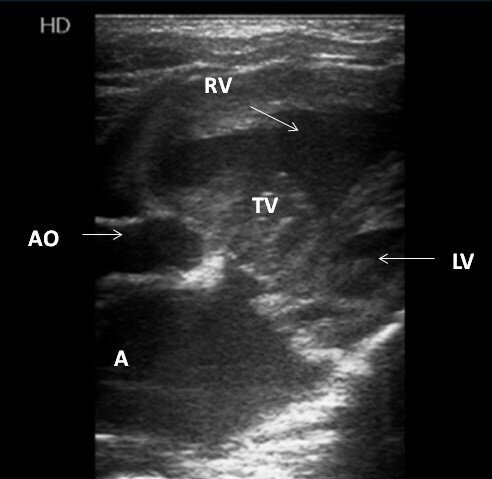 Postnatal echocardiography: The baby was delivered by caesarean section under spinal anaesthesia and needed prolong resuscitation after birth. Postnatal echocardiography was done on day 2. Findings included a single atrium, opening and closing of the tricuspid valve (TV), prominent single ventricle having the morphology of the right ventricle (RV), and poor visualization of mitral valve movements. The left ventricle (LV) is collapse. Both the great vessels are seen arising from the right ventricle, oriented perpendicular to each other with the main pulmonary artery on the right and anterior to the aortic root (Figure 2). Figure 1. 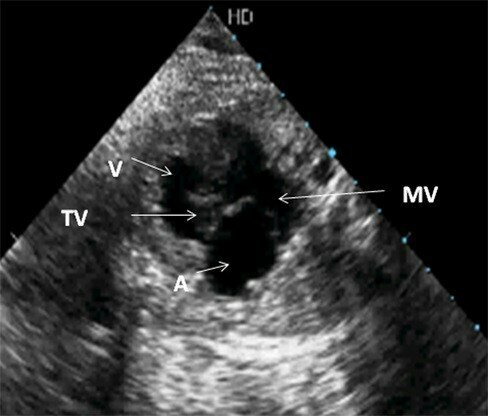 Antenatal four chamber echocardiographic view of the heart, note the single atrium (A) and a very large VSD indistinguishable from the single ventricle (V), normal opening and closing of the mitral valve (MV) and tricuspid valves (TV) were seen. Figure 2. 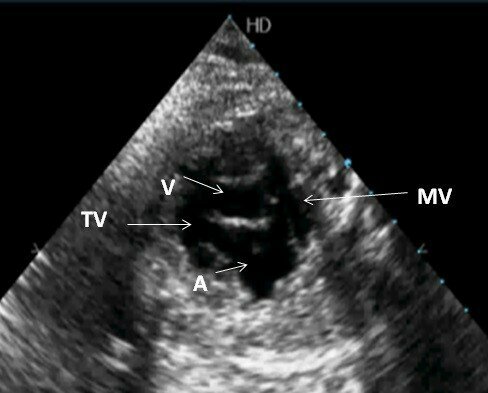 Postnatal echocardiographic images of the heart, note the prominent right ventricle (RV) giving rise to both the aortic root (AO) and main pulmonary artery (MPA) with collapse left ventricle (LV) consistent with a single ventricle of RV configuration and rudimentary left ventricle (LV). Note the normal closing and opening of the tricuspid valve (TV). Single ventricle accounts for 2% of congenital heart defects and is caused by failure of development of the interventricular septum. The single ventricle has a LV configuration in 85% of cases. It may be associated with pulmonary stenosis, atrial septal defect (ASD), common atrium, asplenia and polysplenia. Differential diagnosis includes large VSD or hypoplastic RV or LV . Demonstration of the origin of both the vessels from the same side of ventricular septum is essential to differentiate double outlet right ventricle (DORV) from transposition of great arteries . Our case is a single ventricle with right ventricular morphology. 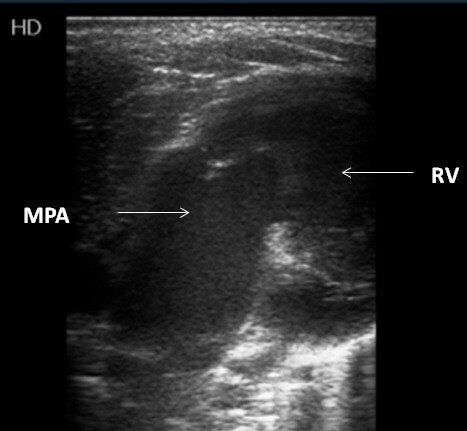 The normal size left ventricle seen antenatally is small after birth and changes to rudimentary morphology due to absent of outflow tracts and resultant hemodynamics. We thank the staffs of Department of Radiology and Imaging, Ganesh Das Hospital (Lawmali, Shillong, Meghalaya, India) for assisting in collecting information about the case. Stamm ER, Drose JA. The fetal heart. In: Diagnostic ultrasound. Rumack CA, Wilson SR, Charboneau WJ, eds. 2nd ed. St. Louis, MO, Mosby, 1998: 1123–1159. Donboklang Lynser – Radiologist, Department of Radiology and Imaging, Ganesh Das Hospital, Lawmali, Shillong, Meghalaya, India. Evarisalin Marbaniang – Assistant Professor, Department of Pathology, North Eastern Indira Gandhi Regional Institute of Health and Medical Sciences, Mawdiangdiang, Shillong, Meghalaya, India. © 2015, Lynser D., Marbaniang E.
Correspondence to Donboklang Lynser. Address: Department of Radiology and Imaging, Ganesh Das Hospital, Lawmali, Shillong 793001, Meghalaya, India. E-mail: bokdlynser@yahoo.co.in. Phone: 91-9774655769.